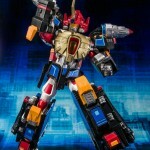 Courtesy of Gamu-Toys we bring you an extensive pictorial review of the recently released Ultra Act Thunder Gridman figure, also known as Synchro from Superhuman Samurai Syber-Squad! This review includes images of the figure using both the previously released Ultra Act Gridman figure, and the unpainted dummy body included with this release. In order to accommodate Ultra Act Gridman’s head under the armour, a larger helmet is also included. Check out a selection of full-sized images from the review after the jump! 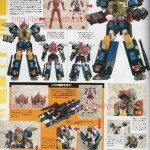 From the latest round of magazine scans, we have a new photo of the up coming Ultra Act Thunder Gridman figure. 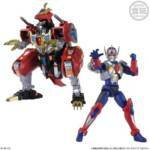 The new scan confirms that Thunder Gridman will include a dummy Gridman body but can still be combined with the stand-alone Ultra Act Gridman figure a side-by-side photo is shown comparing the dummy body to Gridman. This is great news for those that want to display both figures together! Thunder Gridman is due out later this month. 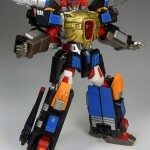 Tamashii’s main page has put up a brief preview gallery of recently-announced Ultra-Act figure “Thunder Gridman,” recognizable to American audiences as “Samurai Synchro” form. 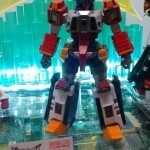 This photo gallery appears to confirm that Thunder will function as armor add-on parts for the recently released Gridman figure instead of as a stand-alone Ultra-Act. Stay tuned to this page for further details! 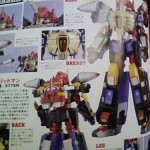 The Cybergundam Blog has posted a new scan from Figure Oh revealing Ultra ACT Thunder Gridman from Gridman! Scheduled for a January 2013 release for 5,500 yen. Click on the thumbnail for a closer look!